This is something I am really, really excited about! 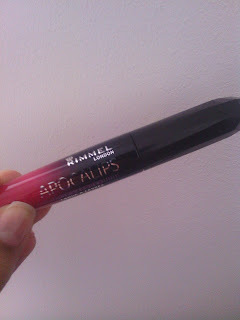 The Rimmel Apocalips Lip lacquers have stormed into the beauty industry and have gone down a great treat! 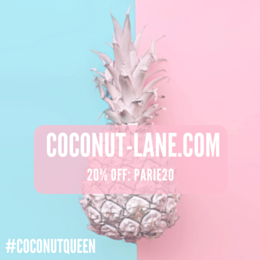 Every blogger has raved about them; and now it is my turn! I finally, purchased the shade 'Apocalyptic' and holy cow.. you guys it is the best thing ever. First off, the packaging is uber cute! I mean I love the element of a like 3D bottle! It's like an alien shape.. itf that makes sense. The consistency of these products are amazing and is what impressed me the most. They are really sort of creamy and full coverage that they last all day!. The applicator has a little well in the centre that collects product so you can apply it with only one or two dips, meaning it uses less than a lipstick would and more than a lip gloss would. 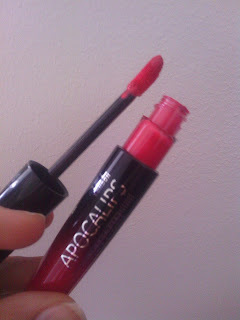 'Apocalyptic' is such a deep pink colour, and the swatch you see on your hand is just how it is on your lips. They smell amazing as well, which is a added bonus! Hat's off to Rimmel! They are so pigments though! I have a love hate relationship with lip products, because I find that many don't stay on long, yet are lovely colours and so on. So this product for me was a test, and it passed! I shall defo me buying more! I have seen so many hypes on blogs about this lip lacquer and I want to try it so bad! The colour of this is gorgeous and is so pigmented, I love it. Lovely blog, now following(: You can check out my blog and follow back via GFC or Bloglovin' if you wish!